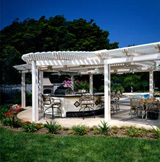 The louvered patio roof system can be incorporated into a range of structures. It can either be free-standing or part of an existing building. Through integrating the system into new home designs or renovation projects, the full potential of the lifestyle benefits can be experienced. The frame can be either timber, steel, aluminium or any other structure that compiles with local building codes. Timber allows the system to complement pergolas or be integrated into traditionally built structures. Steel structures enable the system to be customized in various sizes and architectural styles. Specially designed gutters are fitted along the inside perimeter of the framework to ensure the louvered patio structure is watertight and water is safely run off into downspouts. The use of a range of architectural fittings and facilities ensure that louvered patio structures fit the most exacting and contemporary architectural designs.